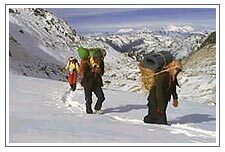 Himachal Trekking - Trekking in Himachal Pradesh are full of fun and adventures. Trekking site of Himachal provides a suitable place for your never forgetting trekking expedition in India himalayas range. There are four mountain ranges running almost parallel to one another in Himachal Pradesh and thus creating charming and beautiful valleys and passes suitable for trekking. There are numerous passes on these ranges which connect the valleys, making good trekkking routes for all types of trekkers. One can cross one pass and return over the other or proceed further to cross another on the next range. There are about two dozen passes on the Dhauladhar, a dozen over the Pirpanjal range and 8-10 such passes over the Great Himalayan range to cross over to the Zanskar valley. Himachal offers a virtual bonanza for trekkers. 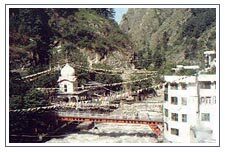 Drive from Kullu and reach the Manikaran hot springs. From here one can take a walk along the Parvati to the secluded village at Pulga. One can take short excursions upstream from here and return to Manikaran. This can be combined with a trek up the Tosh valley bordered by the Pir Panjal range and Papsura and Dharamsura peaks. Another 10-11 day trek can be taken up form Manikaran along the Pir Panjal range. The trail winds its way past Khirganga, Mantalai glacier to the top of the pass on the Kulu-Spiti divide. One reaches Dhankar in Spiti from where one can drive to Kaza and the Kunzum pass into Lahoul or take the Hindustan-Tibet road for Shimla. Moderate to strenuous trekking for 5 days, over the Beas-Chenab watershed leads to the Hamta Pass on the Pir Panjal range. The trek offers some excellent views of high peaks such as Indrasan and Deo Tibba. The Chandrabhaga triangular trek traces sources of the Chenab. Then there is the moderate trek for 3-4 days accesses the Chanderkhani pass. The trek begins at Jari and gets to the secluded Malana village which is said to be among the world's oldest democracies. The Sach pass crossing entails fairly strenuous trekking for 4 days. The trek begins at Trela. Once the Pass is crossed, there are ample opportunity for the crosssroads enthusiast.